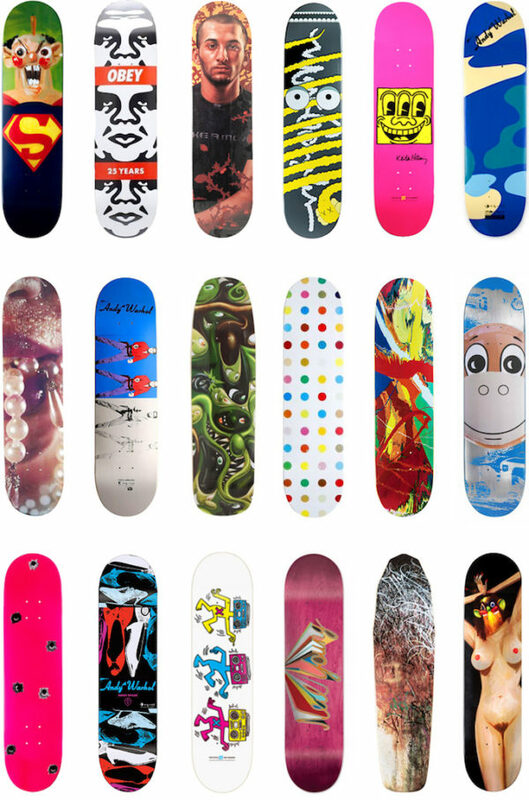 Cohen has been collecting skateboard decks for the last decade, and has amassed one of the most impressive collections of contemporary art on wheels (actually these decks are not meant for riding and rarely have wheels mounted). We are thrilled to be offering for sale some of her most popular and collectible decks now available on GC/EDITIONS. Made in conjunction with The Andy Warhol Foundation. Stamped signature, numbered on top of deck. Lithograph on seven-ply Canadian maple wood. Limited edition issued by the Andy Warhol Foundation and Alien Workshop. Silkscreen on a maplewood. Screen print on Polychromed Wood. Each signed “D Hirst” and stamped “Supreme”. Stamped with signature stamp verso. Screen print on wood. Limited edition silkscreen on wood. Printed with signature and inscription “Monkey Train/JK” on base of deck. Limited edition made for the Jewish Museum in New York. Canadian hard rock maple wood. Screen print on seven-ply Canadian maple. Limited edition screen print. Printed signature on reverse. Screen print on wood. Plate signed and inscribed on reverse. Bendy Skateboard Deck Gonz Supreme. Collaboration between Mark Gonzales’ Krooked Skateboarding and graffiti artist Kaws. Screen print Polychromed Wood. Stamped on back of deck. Screen print on wood skate deck. Screen print on wood skate deck. Plate signed on the back.